After a hard-fought re-election campaign, President Barack Obama and his team now turn to the work of developing their second-term agenda. Since the election there has been widespread recognition that America’s changing demography helped drive the president’s victory, and this recognition has helped propel immigration reform to the top of Congress’s agenda. But the country has been slower to recognize the critical impact of women voters. The fact is that women voters decided the outcome of this election—despite losing the male vote, President Obama was reelected because he won the support of 55 percent of women voters. The resulting 10 percent gender gap was one of the largest in recent decades. So as the president seeks to forge a lasting legacy, he should seize this opportunity to take action on policies that will positively impact women’s lives. While women now make up half the workforce, women, particularly single women, remain uniquely economically vulnerable. The poverty rate for women is at the highest in two decades, women lost ground in the Great Recession, and basic necessities like child care and housing remain unaffordable for too many. Moreover, although mothers are now the primary breadwinners or co-breadwinners in nearly two-thirds of American households with children, women spend more than twice as much time as men providing primary care to children. And as more and more households are led by lower-income single mothers, this economic instability is also having a dire impact on growing numbers of American children. In light of these challenges, perhaps the most important way in which the president can directly improve the lives of millions of American women and families across the economic spectrum is to make a bold commitment to educate and care for children during the first years of their lives. These policies would advance several important national priorities. First, expanding access to preschool and affordable child care would directly improve the lives of millions of mothers and fathers who are struggling to balance the demands of work and family. In addition to the increase in single-parent households, many more two-parent households now have two working spouses. As a result of these two trends, the share of American families with children that have a male breadwinner and a female homemaker dropped from more than half in 1975 to just one in five in 2011. Without a full-time parent caretaker, families with children under the age of 5 now spend an average of 10.1 percent of their household budget on child care. The burden on low-income families is especially heavy—families making less than $1,500 a month who pay for child care for children under the age of 5 spend on average 52.7 percent of their income on these expenses. Finally, early childhood investments will help address our growing economic inequality and diminishing rates of upward mobility. These trends have been exacerbated by the dramatic changes in America’s family structure. Perhaps the most worrisome change is the increasing number of children who are being raised by low- and lower-middle-income single parents, particularly single mothers. As one sociologist has remarked, “it is the privileged Americans who are marrying, and marrying helps them stay privileged.” By contrast, lower-income single parents must get by on a single paycheck and without a spouse to help with child care responsibilities. In part as a result, children growing up in a household with only one lower-income parent are more likely to struggle in school, to earn less income as adults, and to experience a wide range of less-favorable life outcomes. By investing in these children while they are still young, we can have a much greater impact at less cost. All children should have access to high-quality preschool. Economists like Federal Reserve Chairman Ben Bernanke and Nobel Laureate James Heckman agree that preschool produces a very high return on investment. And they agree that many of the benefits such as lower crime and higher worker productivity go not only to the children but also to their families and society at large. Despite these benefits, some people will surely ask whether it’s sensible to spend more money on preschool right now, just as we’re trying to tighten our fiscal belts. This concern is understandable but misplaced. Studies show that investing money in high-quality preschool will actually improve our country’s fiscal health by strengthening human capital, enhancing economic growth, increasing revenues, and decreasing future spending obligations. With all these benefits, universal preschool shouldn’t be a partisan issue. And indeed, Republican-controlled states such as Oklahoma and Georgia have become national leaders in early childhood education. But although nationwide preschool enrollment has increased to 74 percent among 4-year-old children and 51 percent among 3-year-old children, the lowest-income and most disadvantaged children are the least likely to participate in preschool programs. And children from middle-class families are only slightly more likely to participate—or sometimes less likely when gradations of family income are compared. Preschool opportunities for 3-year-olds appear to be a particular challenge for some middle-income families. Among 3-year-olds, 34 percent of children in families earning $50,000 to $60,000 participate in preschool programs, compared to 42 percent of children in families earning less than $10,000. The fact that low-income children are participating in preschool at roughly the same rates as some middle-income children is largely due to the successful efforts of government-funded programs such as Head Start and state pre-K programs that target low-income children. The federal government should build on these efforts by improving the quality of existing preschool programs and expanding access to families of all means. A bold agenda to expand preschool opportunities must address the shortcomings of our current patchwork delivery and funding system. Existing preschool dollars often narrowly target children and services, forcing preschool providers to—at best—“blend and braid” funds to deliver services. This ad hoc system has resulted in enormous challenges related to tracking enrollment, use of funds, and program effectiveness. A new federal preschool initiative would provide the opportunity to streamline and strengthen the educational effectiveness of current federal early education investments, including Head Start. Federal policymakers should put forward a proposal to enable every child to attend two years of high-quality public preschool and strengthen the alignment between preschool and third grade. Under CAP’s plan the federal government would, on average, match state preschool expenditures up to $10,000 per child per year. This amount is enough to provide high-quality full-day (nine-hour) prekindergarten to families who want it, while also enabling families to choose shorter-day alternatives. The total nationwide cost of this program would be evenly split between the federal government and the states. The U.S. Department of Education, however, would provide federal grants to state education agencies based on a matching formula that considers district concentration of poverty, state fiscal effort, and the cost of providing education. States would be required to contribute their own funding to receive the federal match. The estimated 10-year federal cost is $98.4 billion over existing spending levels. Our plan phases in over five years—first enrolling low-income children and expanding to full coverage by the end of the fifth year. Once the program is fully scaled, it will cost an additional $12.3 billion per year. All children ages 3 and 4 should be able to voluntarily attend a full-day public preschool program. Preschool should be free for children from families at or below 200 percent of the federal poverty line ($46,100 for a family of four). Children from families above 200 percent of the poverty line should be charged a sliding tuition co-pay, ranging from about 30 percent of the cost to 95 percent of the cost (for families above 400 percent of the poverty line). Eligible providers should include local education agencies (school districts, charter schools), and Head Start programs, child care agencies, and community-based providers of prekindergarten programs in partnership with local education agencies. 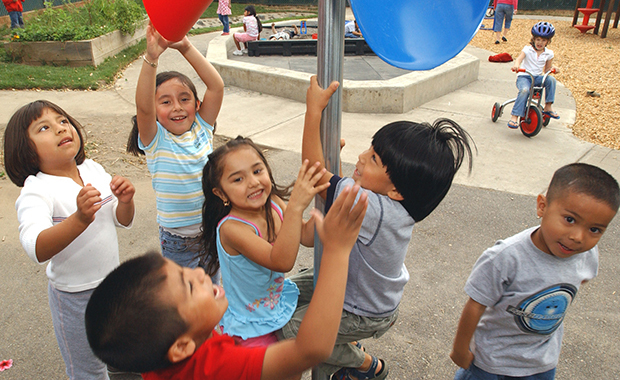 We know that expanding access to high-quality child care is critical for children. But investing in child care will also generate large benefits for parents and employers and will help spur economic growth. Studies have demonstrated that parents with reliable child care are better able to get and maintain jobs and are able to work longer hours and earn more money. In addition, historical data suggest that improving the availability of child care could save employers billions of dollars from avoided employee absences and increased worker productivity. Expand access to subsidized child care for low-income parents. Increase the federal child care subsidy to make child care more affordable. Improve the quality of child care. Expand enrollment in Early Head Start. Our first objective is to expand the number of families at or below 200 percent of the federal poverty line who receive access to subsidized child care for children ages 0-3. Currently, roughly only 22 percent of these children receive federally subsidized child care. Our second objective is to increase the size of the federal subsidy. The average federal child care subsidy for 0- to 3-year-olds is roughly $5,600 a year. This amount, however, falls considerably below the average cost of care. This subsidy gap creates significant affordability challenges even for those low-income families who are lucky enough to receive any subsidy. In light of these first two objectives, CAP’s plan would revamp our current child care funding system in order to increase access to subsidized child care for 0- to 3-year-olds while also increasing the size of this subsidy. Specifically, the federal government would offer states substantially higher grant amounts through the Child Care and Development Fund, or CCDF, on the condition that they spend $1 for every $3 the federal government spends. The federal government would thus cover 75 percent of total nationwide child care costs. This plan would be phased in over five years. This new federal investment would enable states to double access to federally subsidized child care for low-income families from 22 percent to 44 percent while also raising the child care subsidy amount by roughly 25 percent to an average of $7,200 per child. This plan increases federal funding by $10.5 billion per year above current levels and has a 10-year federal cost of $84.2 billion. Our third objective is to increase the quality of child care for children 0-3 years old. Under our plan states would be required to adopt child care standards that are developmentally appropriate, cover all essential areas, and promote early learning gains. To help states in this effort, the U.S. Department of Health and Human Services would release guidelines that cover the essential elements of high-quality child care standards. To improve quality, states would also be required, within three years of receiving federal funds, to develop and implement a Quality Rating and Improvement System, or QRIS, for their federally funded child care programs. Every state’s Quality Rating and Improvement System must include a progression of quality ratings that are publicly reported, clearly differentiated, cover multiple rating categories, and are tied to the state’s child care standards. In addition, the federal Child Care Development Block Grant quality set-aside funds would be used to reward states that invest in child care staff training focused on early learning strategies and establish minimum pay scales based on experience and training that attract and retain high-quality child care workers. States would be required to follow these new standards in administering all child care programs that receive federal funding. Finally, our fourth objective is to increase enrollment in Early Head Start, a program that has proven to be extremely effective. Therefore, in addition to the policies laid out above, we also propose to double enrollment in Early Head Start, which currently enrolls 120,000 children at an average annual cost of $12,000 per child. Doubling Early Head Start would cost an additional $1.44 billion per year and $11.5 billion over 10 years. The research is clear: High-quality early childhood education and care is a game changer. We should work toward a future in which all children from ages 0-5 have access to them. As we continue to combat rising economic inequality, high-quality early childhood investments will help all children realize their full potential and provide enormous long-term benefits to society. What we need now is bold political leadership to make it a reality. Cynthia G. Brown is Vice President for Education Policy at the Center for American Progress. Donna Cooper is the executive director of Public Citizens for Children and Youth and was formerly a Senior Fellow with the Economic Policy team at the Center. Juliana Herman is a Policy Analyst with the Education Policy team at the Center. Melissa Lazarín is Director of K-12 Education Policy at the Center. Michael Linden is the Director for Tax and Budget Policy at the Center. Sasha Post is Special Advisor to the President of the Center. Neera Tanden is the President and CEO of the Center.